In urban cities like Chatham, New Jersey which has frequent power outages as a result of heavy thunderstorms owning a generator is the best bet. For homes having generators, the generator helps them to power their electrical appliances to meets their needs. So irrespective of power outages, there is sufficient backup power from generators for life to move on. They’re installed and serviced by our generator experts. Thinking of purchasing a generator? 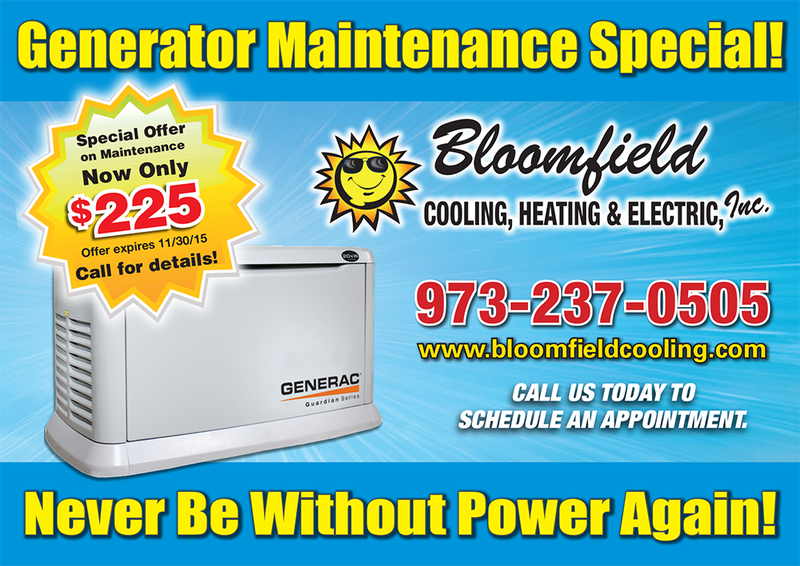 At Bloomfield Heating, Cooling and Electrical service we have the answer to all your power needs. In operation since 1988, we’re a family operated firm with multiple awards and a long list of satisfied and happy clients. Everything related to power, electrical and generators is done at Bloomfield Electrical. From buying to installation, maintenance, and repairs of generators, we service all. Book an appointment with us today. We select the right generators that will meet our customer’s needs and benefit them optimally. With generators from the trusted brands like Generac Power systems, you can never go wrong as we offer to upgrade to stand-by generators options. We are well prepared to install generators as it is our professional handling service. Our workmen have the requisite certification and experience to carry out generator systems. Mistakes resulting in explosions and dangers may arise if given to an amateur. Effective and scheduled servicing ensures that a generator will keep running smoothly. We provide this maintenance to give you peace of mind. We have specially trained electricians who are well versed in electrical installations. Though we are fully insured, we still make sure all safety rules are maintained with regular HSE training given to our staff. All cables, components, and materials are industry certified and are of high quality. With our customer-friendly staff, your satisfaction is guaranteed. Our offices are open throughout the day and all week long. Rest assured our prices are within reach and are affordable. Contact us to request a proposal and we’ll deliver it on time.